I don't remember if I posted the recipe before - finally I couldn't find it so I'll post it again. It's one of those fast one-dish-meals which I totally love. I was invited to friends in the evening to spend the Shabbat (Wikipedia) with them so I knew the food for supper will be brilliant. I am not Jewish but I celebrate every festival when I know there will be great food, good and interesting conversations and nice people. And I do not care where I am praying, in a church, a synagogue or in the middle of a field as long as I keep doing it and it comes out of an honest heart. This time I really wanted to take part in a service because I have so much to be thankful for to the One over us - however He is named or who He is. The evening and the food were brilliant, so thank you very much to L. & A. for the hospitality and the nice time I had in your family. Knowing that I'll get tasty food in the evening I went lazy and took a look into my fridge. The fastest and easiest possibility to get some food during the day was to make a tarte. I still had a package of puff pastry and I had some mozzarella and chopped cheese and vegetables. The recipe is easy. Take a package of frozen vegetables (about 1 1/2 lbs.) and stew it with soy sauce for about 10 minutes until the water steams out. In the meantime butter a tarte baking pan and roll the puff pastry in the pan. Lay the baking paper the puff pastry was rolled in (at least in Germany it's always rolled in baking paper) over it, and pour beans or soy beans or something else you have over the baking paper. Put the baking pan to the oven and bake it for about 20 minutes. 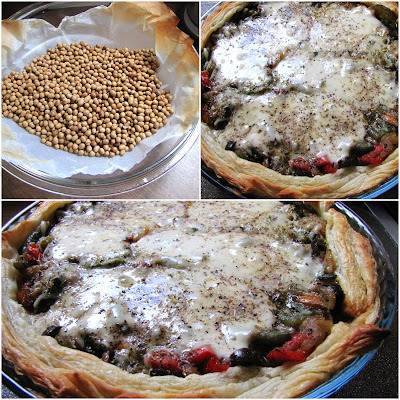 After the pastry is nearly ready, put it out of the oven, take the baking paper with the beans out and add the vegetables to the hole you got in the pastry. Add the mozzarella on the top and some chopped cheese, add pepper and herbs (basil oregano). Bake it again for about 10-12 minutes until the cheese melts. That's all. Enjoy the tarte with some tzatziki or yogurt. Advice: You can not use the beans for eating anymore, but keep them in a jar after they cool down and use them for the next "false baking" of a puff pastry. I think I use the same beans since more than three years. I was so hungry and fixed on COOKING that I forgot to take some pictures while preparing the tarte. But I hope you got the point reading the preparing instructions.